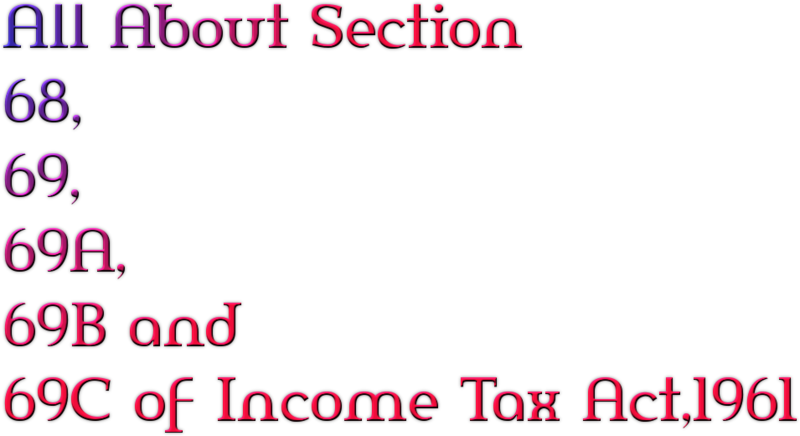 CA Priya FulwaniIn this article Author has discussed comparison between Section 68, 69, 69A, 69B and 69C of Income Tax Act,1961 and Important Case laws related to these sections. Where any sum is found credited in the books of an assessee maintained for any previous year, and the assessee offers no explanation about the nature and source thereof or the explanation offered by him is not, in the opinion of the Assessing Officer, satisfactory, the sum so credited may be charged to income- tax as the income of the assessee of that previous year. Where in the financial year immediately preceding the assessment year the assessee has made investments which are not recorded in the books of account, if any, maintained by him for any source of income, and the assessee offers no explanation about the nature and source of the investments or the explanation offered by him is not, in the opinion of the Assessing Officer, satisfactory, the value of the investments may be deemed to be the income of the assessee of such financial year. Where in any financial year the assessee is found to be the owner of any money, bullion, jewelry or other valuable article and such money, bullion, jewelry or valuable article is not recorded in the books of account, if any, maintained by him for any source of income, and the assessee offers no explanation about the nature and source of acquisition of the money, bullion, jewelry or other valuable article, or the explanation offered by him is not, in the opinion of the Assessing Officer, satisfactory, the money and the value of the bullion, jewelry or other valuable article may be deemed to be the income of the assessee for such financial year. Where in any financial year the assessee has made investments or is found to be the owner of any bullion, jewelry or other valuable article, and the Assessing Officer finds that the amount expended on making such investments or in acquiring such bullion, jewelry or other valuable article exceeds the amount recorded in this behalf in the books of account maintained by the assessee for any source of income, and the assessee offers no explanation about such excess amount or the explanation offered by him is not, in the opinion of the Assessing Officer, satisfactory, the excess amount may be deemed to be the income of the assessee for such financial year. Where in any financial year an assessee has incurred any expenditure and he offers no explanation about the source of such expenditure or part thereof, or the explanation, if any, offered by him is not, in the opinion of the Assessing Officer, satisfactory, the amount covered by such expenditure or part thereof, as the case may be, may be deemed to be the income of the assessee for such financial year. Provided that, notwithstanding anything contained in any other provision of this Act, such unexplained expenditure which is deemed to be the income of the assessee shall not be allowed as a deduction under any head of income.